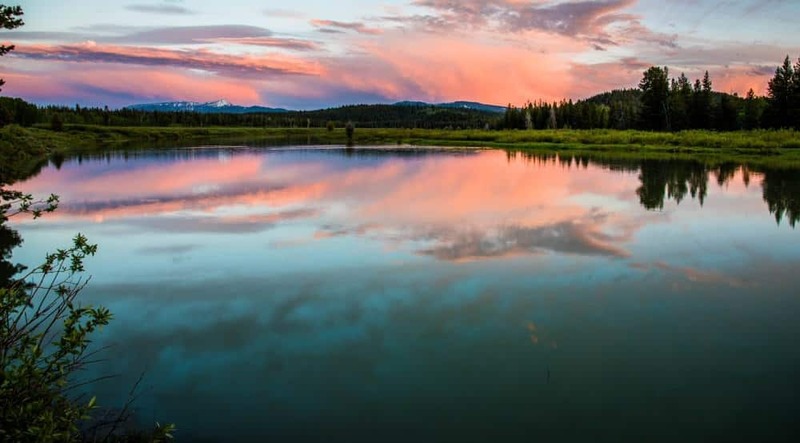 Photos taken at sunset capture the soft, diffused light that happens as the sun sets. The Golden Hour light, approximately 30-60 minutes before sunset, is a warm golden glow that produces long, soft shadows. After the sun disappears behind the horizon, the Golden Hour transforms into the Blue Hour. The characteristics of the Blue Hour are a much darker sky and soft blue hues. Sunset photography produces different visual effects in a very short period of time because the quality of light constantly changes. But, it’s also a tricky and complex time to take photos. As the photographer you must be ready for the changes and adjust your technique and settings as the light changes. We share our sunset photography tips so you can get amazing sunset photos. Sunset happens quickly and the light is constantly changing. You must scout the location and determine composition before you show up to take photos. 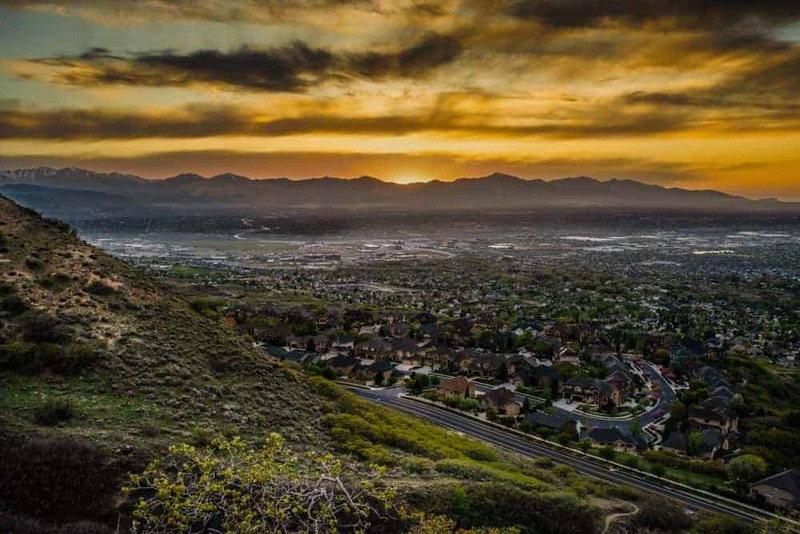 Find locations that have the right elements to capture a stunning sunset photo. The most popular type of sunset photo is to have a clear line of sight to the horizon where the sun will set. Yes, you get to have the setting sun in your photos, but it also allows you to keep your camera focused on one location as the sunset progresses. This makes it easy to only focus on adjusting your settings as the light changes, and not worrying about moving from one place to another. We found a spot at the rim of the Grand Canyon where we could see the setting sun on the horizon. 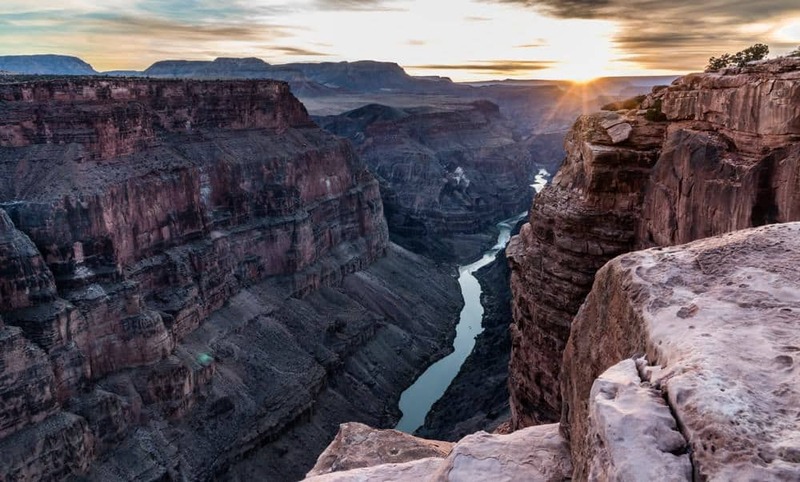 The spot also included the Colorado River and sheer canyon walls as points of interest in the photo. Find an element that will provide interest to the photo, in addition to the setting sun. 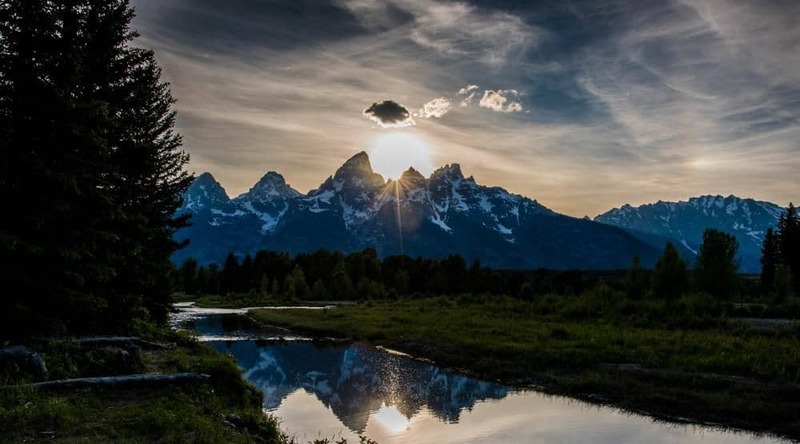 The Teton mountains at Grand Teton National Park are spectacular. We found a location that would allow us to capture the setting sun as it began to dip behind the mountain peaks. And to have that scene reflected in the river was an added bonus! 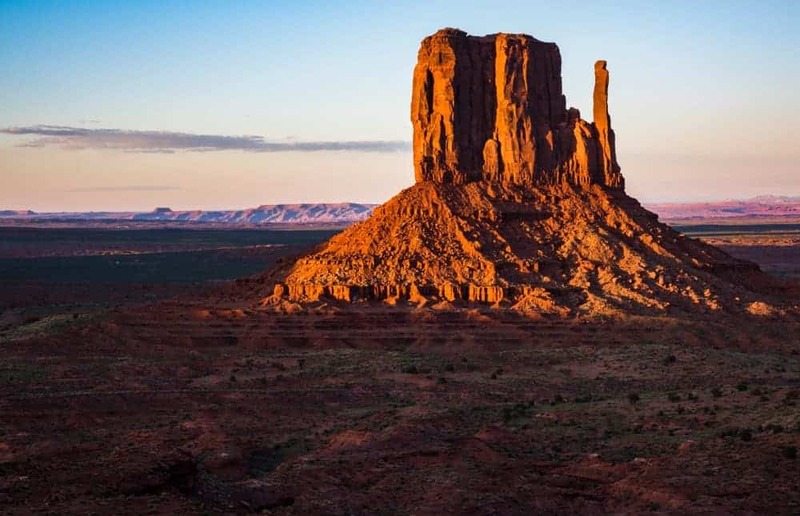 A striking landscape photo, and this includes sunset photos, usually includes something out of the ordinary like clouds, fog or a reflection. This photograph at Oxbow Bend in Grand Teton National Park includes clouds and a reflection. The sun had already set, but the clouds illuminated with wonderful colors. And again, the scene reflected in the calm river adds even more interest. Natural elements are all around. Find that ‘something’ to help set your photo apart from the everyday landscape scene. For example, we were at Utah Lake one evening in the late winter/early spring. 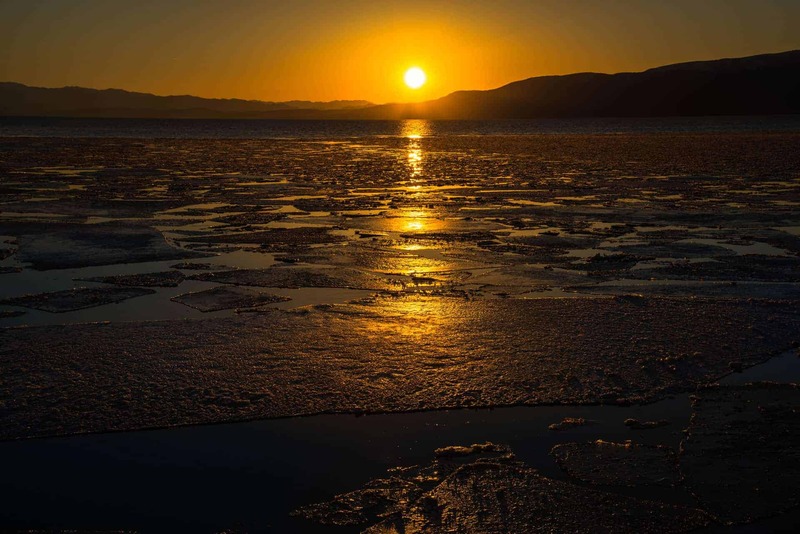 We saw broken sheets of ice floating in the lake, and noticed the golden glow on these ice sheets as the sun was setting. This is something you don’t see every day! As you scout for good sunset locations, don’t limit yourself to only photograph toward the setting sun. There are wonderful scenes and elements that glow with the reflected light as the sun sets. 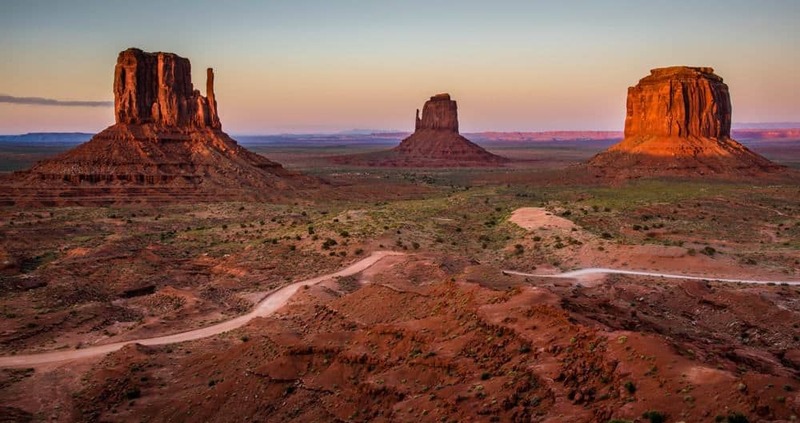 At Monument Valley, the Golden Hour light illuminates the buttes while the surrounding shadows help to make them stand out. You may get tired of us showing photos with reflections in water, but it’s an element of composition that makes your photos pop! 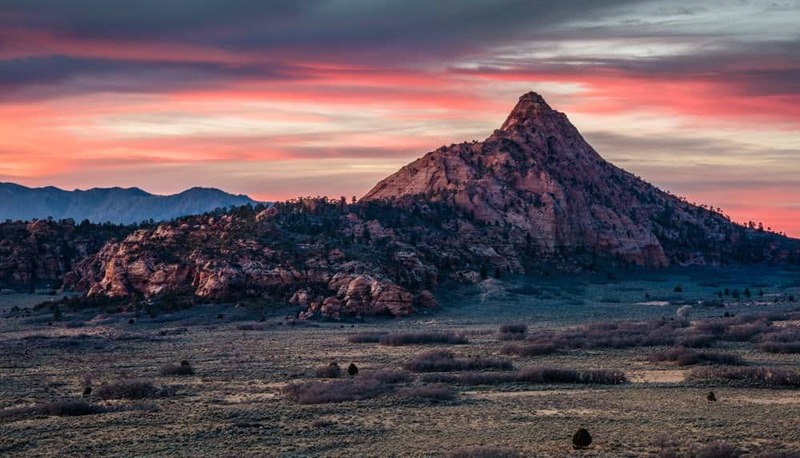 The soft light at sunset is casting a warm glow on the sandstone rocks at Moab, Utah. And look at how the reflection in the Colorado River provides impact and interest. Clouds are one of those things that can instantly elevate your sunset photo. 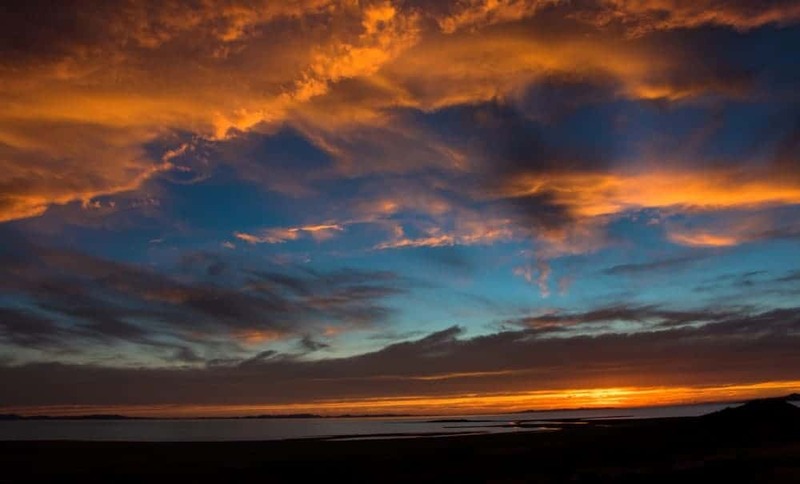 When the clouds capture the colors of the setting sun, you will get spectacular images. The more radiant colors appear when there are small, white, thin clouds very high in the sky. These types of clouds catch the sunlight from beneath and we can see the dramatic colors on the ground. You’ll see perfect sunset clouds when the weather is hot and dry. 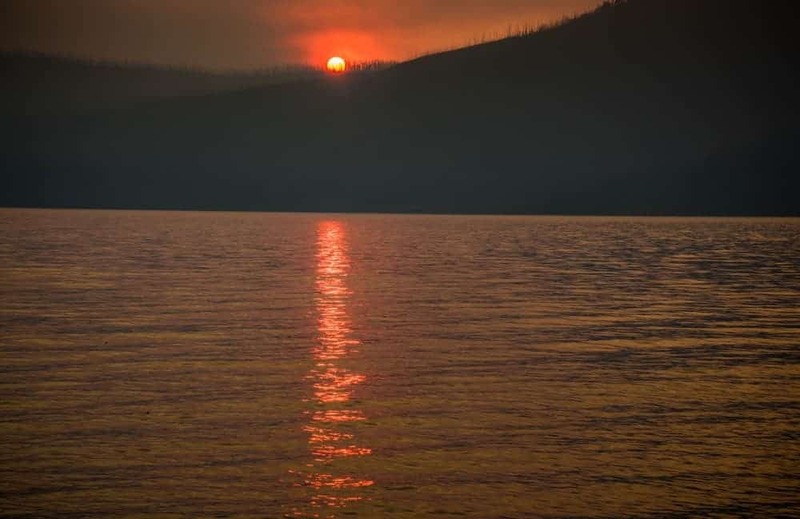 Did you know that when there is smoke or dust in the air, the color of the sun intensifies to orange or even red? 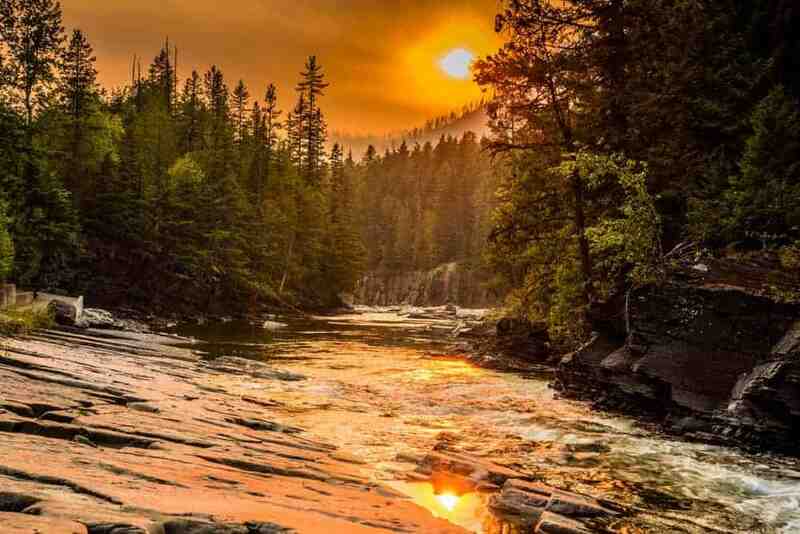 We discovered how beautiful the sun can be with smoke in the air when we visited Glacier National Park during the fall when there was a wildfire in the park. The trick is to find a scene that showcases the sun with elements to provide interest. When the conditions aren’t ideal, use them to your advantage. The quality of the photograph has less to do with the situation, and more to do with how you react to it! There is one thing we hope our students learn from us: ALWAYS pay attention to the sky and landscape behind you. Reflected light and color can create wonderful scenes away from the direction where the sun is setting. 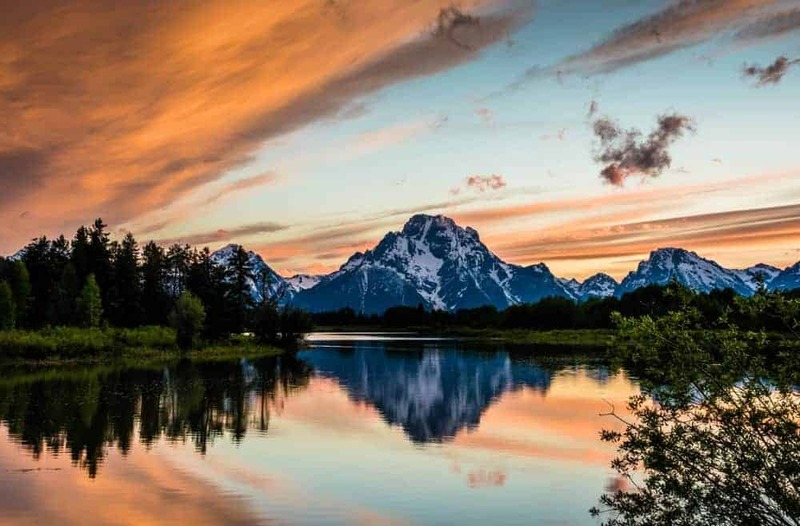 This was the dramatic sky at Oxbow Bend in Grand Teton National Park one evening. Most people were looking toward the mountains where the sun was going down, and they missed it! The light is always changing as the sun drops toward the horizon. As the sun moves and sets, the colors you capture will change as well. 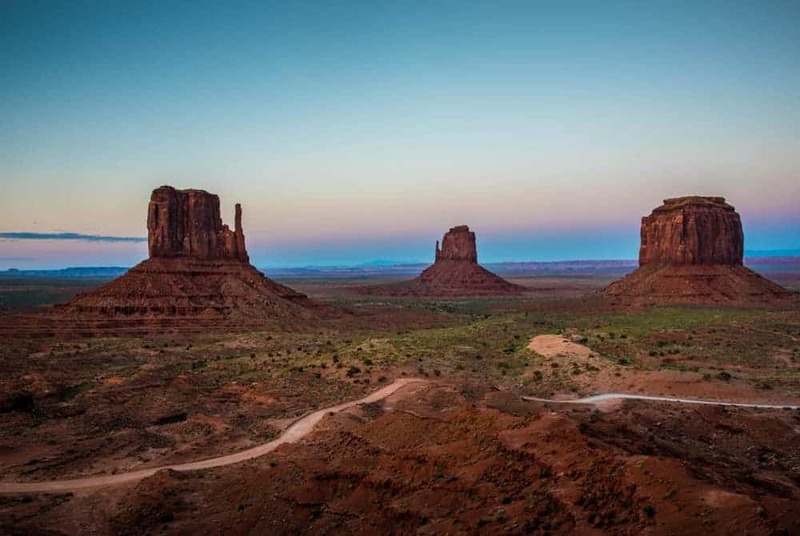 Golden Hour light produces orange, red and pink hues as seen in this photo at Monument Valley. Notice the same scene taken a bit later during the Blue Hour. Photos taken at this time include more cool hues like blue and purple. Don’t put your camera away after the sun drops below the horizon! There is variation of color in the sky that you can’t see. It’s so subtle to our eyes, but the camera will capture it. 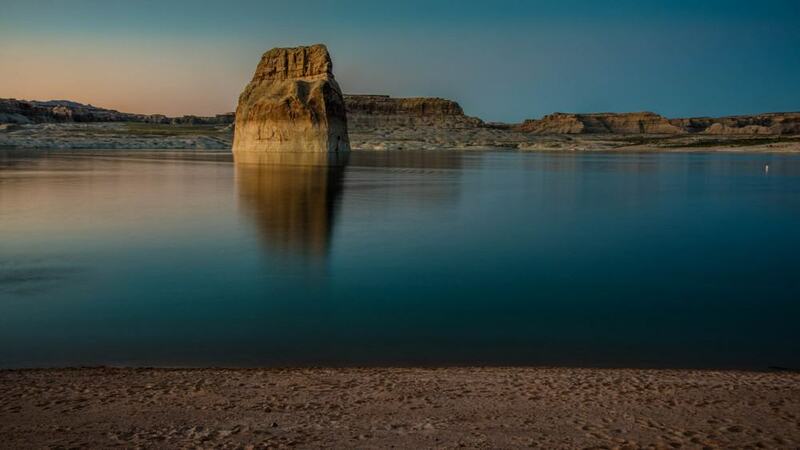 We rushed to this beach location at Lake Powell in Utah to photograph Lone Rock. It was pretty dim when we arrived, and I was skeptical we would get a good photo. As you can see, the camera was able to capture the scene just fine. Dave did have to process this photo a bit in Lightroom, but not too much. Your camera will need low-light capability to get good images. My smartphone photos turn out too grainy once the sun sets.